Believe it or not, our staff enjoys more in life than just dentistry..
so we occasionally spend time together outside the office doing fun activities. 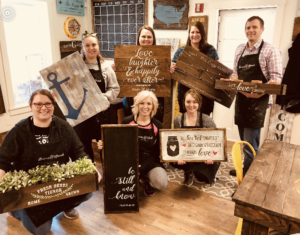 Last week, we went to Board & Brush to create custom wood signs. Ashley and Dr. Cromwell made boxes to fill with plants and succulents, and Alexis made a sign to use at her wedding THIS FALL! 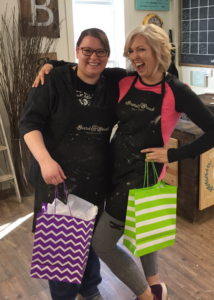 Lisa & Lauren made signs to give as gifts, and Marie and Sarah made new decorations for their homes. We were all successful, with only a few funny accidents! We were also celebrating DENTAL ASSISTANT WEEK!We are lucky enough to have these two hardworking girls who keep the laughs coming. Read more about them HERE! We are a very close work family, and our patients can tell as soon as they walk in the door! We work hard and provide excellent care, all while being with our friends. Come check us out!